Slurp: it’s even sweeter than it looks. This kind gorilla loves ice cream – and sharing! We’ve got a question for you: what’s the nicest ice cream flavour? It’s a tough one, right? The animals at Little Sam Sundae’s ice cream parlour aren’t sure. So they try out some new flavours. Hen asks for a worm cornet. Mouse wants a blue cheese sundae. 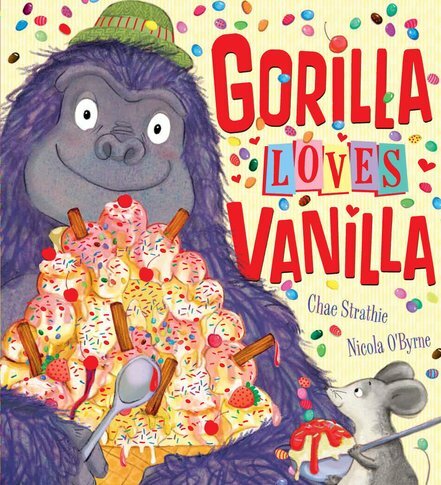 Finally, it’s Gorilla’s turn – but he just orders plain old vanilla. Boring! Or is it? Soon his friends decide they’ve not made very good choices. Sometimes plain is perfect. Luckily, Gorilla loves sharing!